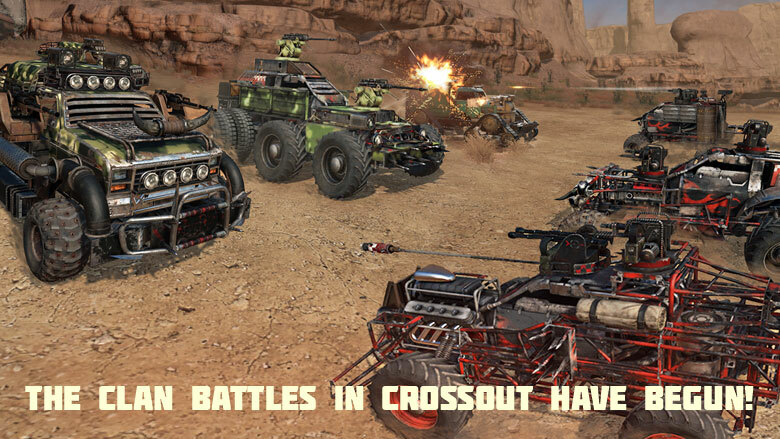 Clan Battles in Crossout have begun! Engineers urgently need uranium ore! Nobody knows why, but they pay for it generously. Every week they broadcast the coordinates of ore deposits so that free adventurers can collect the ore on their own. But now a full-scale war is on for the uranium deposits. Loners perish in an instant in the brawl for uranium, so survivors form clans together. The weekly tournaments begin today in test mode. To take part in the tournament, you need to create your own clan and lead it to victory! Any players from the clan can participate. Teams of 4 clan members face off in battle. You can only fight against players from other clans. Clans get points for participation in battle. Points form the clan's ranking, which defines its place among the other clans. A clan's mission is to rank as high as possible in the tournament. All players in the clan by the tournament's end get the prize at the end of the tournament. The reward at the end of the Tournament is given to all players in the clan, that took the high place in the leaderboard, at the time of the reward. 1st place - 50 ore to each player. 2-10 places - 30 ore to each player. 11-20 places - 20 ore to each player. 21-30 places - 10 ore to each player. Rating is reset for the next tournament. Winning a battle increases clan rating, losing reduces it. Introducing a new restriction for clan battles: end of the week rewards will only be issued to players with at least 10 completed battles.